Here's a free printable piano chords chart (PDF) for beginners! 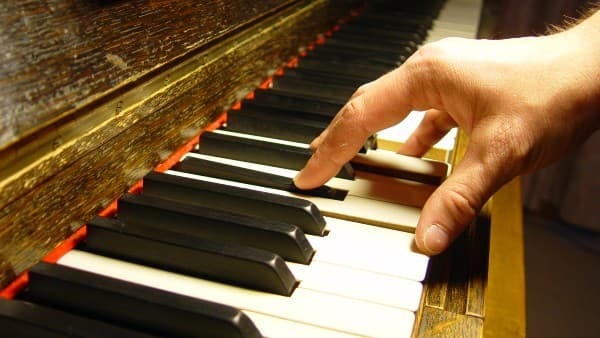 In this easy piano lesson you'll get tips on how to use this chord chart for piano playing. 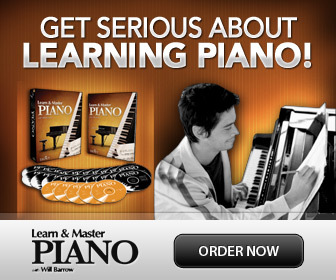 You'll also learn how chords are built and get tips on how get started playing chord piano. Have fun! When you start to learn piano chords, I also recommend that you get a music book with melody and simple chords to practice with, like this Easy Fake Book that I use in my studio. It has easy, beautiful songs to practice playing easy chords to, and making (faking) your own accompaniments. A piano chords chart is a handy tool especially when you start learning how to play chords. This chord chart shows you the most common chords in root position; major, minor, diminished, 7th chords and Major 7th chords in all keys. Click on the link below the image to get your PDF. First pick a piece with chord markings and melody, or just lyrics and chords. You can use anything you like for guitar with chord tabs as well- since chord names for piano are the same. Highlight the different chords that are used- it might seem like there are a lot, but usually there are only a few chords, or a specific chord progression. Study the piano chords chart and learn the patterns (how they look) of the chords you'll be using. Next, write those chord names on a piece of paper and practice only the different chords that are used until you know them well. Then, practice the chords in the order of the song, until fluent. Finally, sing or hum the melody of the piece you picked, playing the chords at the right words! A three note chord, or a triad. The notes of a chord in root position are all spaced an interval of a third apart. You actually “build” chords by stacking thirds on top of each other. Depending on if the thirds are major (big) or minor (small) and in what order they are stacked, you get different types of chords. The most basic piano chords are either three-note or four-note chords. Basic three note chords are also called "Triads". The Major Chord is a triad (a three note chord) made of a major third and on top a minor third. This creates the specific sound of “major”; a “happier”, “lighter” sound. It is written for ex. : E (Root=E, major chord). The Minor Chord is built with a minor third and on top a major third. This gives the sound of “minor” a more “sad”, “darker” sound. It is written for ex. : Am (Root=A, minor chord). The Diminished Chord is made from only minor thirds. This gives the chord a sound like it really wants to go somewhere, to be resolved somehow. That is why it is often referred to as a Dominant 7th chord with no root. It is written for ex. : D dim (Root=D, diminished chord). The Augmented Chord is built from only major thirds; it also has a very “unresolved” sound. The 7th chord is a four note chord. It has a root, a third, a fifth and a seventh. A “regular” 7th chord, also called a Dominant 7th chord, for example C7, is made from a major chord plus a minor third on top. That would make the thirds stacked like this (from the bottom and up): major third, minor third, minor third. A Major 7th chord, for example Cmaj7, is a major chord plus a major third on top. The thirds are stacked like this: major, minor, major. When playing chord piano using for example a “Fake book". I use this Easy Fake Book (Amazon) with my students, which is a great way to learn to play chords and melody following a lead sheet. A lead sheet has only the melody written with notes (or only lyrics), and above it the chords are written as chord symbols, like Cmaj7, Eb dim. or Bm for example. If you already know the melody, you only need the lyrics and the chords. You can either sing the melody of the song (or have someone else sing it!) and make up your own accompaniment, or pick out the melody in one hand and play the chords in the other. Use the piano chords chart above when you need to remind yourself how to play basic chords in root position. However- make sure to check out my beginner piano lesson about how to play piano chord inversions to learn how you can change the position of the chord for smooth transitions from one chord to the next. You can also learn about, and print my handy piano chord inversions charts here.